A mountain bike is a rugged bicycle that is built to withstand the stresses of off-road biking. However, any bicycle, including a mountain bike, can be converted into a stationary exercise bike. 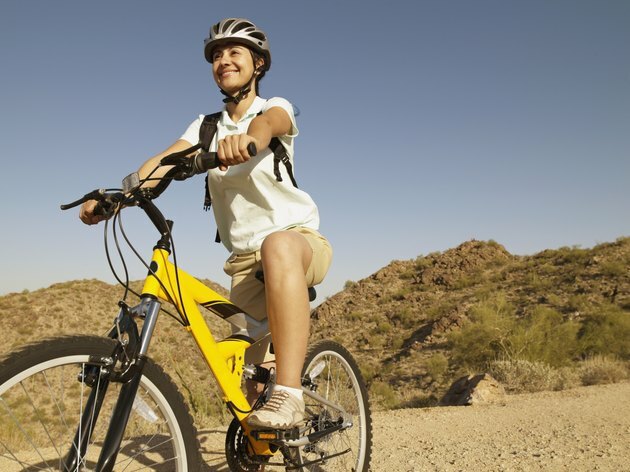 If you are an avid mountain biker and want to remain in shape during the off-season, you can exercise on your mountain bike indoors safely and effectively by converting it into a stationary exercise bicycle. This conversion will allow you to continue staying in shape even when you are unable to go outside for a bike ride due to weather conditions or time constraints. Purchase a stationary bicycle stand, also called a bicycle trainer. You can purchase these stands online or in most bicycle or sporting goods stores at prices that typically range between $45 and $350. Most stationary bicycle trainers are "one size fits all," however some are specifically built for mountain bikes, while others are built for road bikes. Select a stationary bicycle trainer that can fit a mountain bike frame. Clear an area in a room or your garage that is large enough to fit your bicycle and the stand. A hard floor is best, as this will provide a sturdy base for your bicycle and the stand to rest on. Remove the stand from the package and place it on the floor. Most stationary bicycle stands do not need any assembly. If some assembly is required, there are usually just two to three steps to put it together. Follow the instructions that are included in the box to assemble the stationary bicycle stand. Place the back tire of your mountain bike on to the stand and use the clamps on either side of the stationary bicycle stand to hold the wheel in place firmly. Inspect your mountain bike on the stand and make sure it is firmly secured to the stationary bicycle stand. When you are riding the mountain bike with it attached to the stationary stand, the back wheel will move in the stand, but your front wheel will not. It may be helpful to place a towel underneath the front end of your mountain bike, not only to catch your sweat as you ride, but also to prevent any dirt or mud that may come off your front tire from depositing on the floor.